Isotopes are variants of a particular chemical element which differ in neutron number, and consequently in nucleon number. 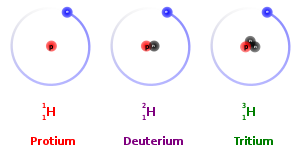 All isotopes of a given element have the same number of protons but different numbers of neutrons in each atom. The term isotope is formed from the Greek roots isos (ἴσος "equal") and topos (τόπος "place"), meaning "the same place"; thus, the meaning behind the name is that different isotopes of a single element occupy the same position on the periodic table. It was coined by a Scottish doctor and writer Margaret Todd in 1913 in a suggestion to chemist Frederick Soddy. For example, carbon-12, carbon-13, and carbon-14 are three isotopes of the element carbon with mass numbers 12, 13, and 14, respectively. The atomic number of carbon is 6, which means that every carbon atom has 6 protons, so that the neutron numbers of these isotopes are 6, 7, and 8 respectively. Theory predicts that many apparently "stable" isotopes/nuclides are radioactive, with extremely long half-lives (discounting the possibility of proton decay, which would make all nuclides ultimately unstable). Some stable nuclides are in theory energetically susceptible to other known forms of decay, such as alpha decay or double beta decay, but no decay products have yet been observed, and so these isotopes are said to be "observationally stable". The predicted half-lives for these nuclides often greatly exceed the estimated age of the universe, and in fact there are also 27 known radionuclides (see primordial nuclide) with half-lives longer than the age of the universe. F. W. Aston subsequently discovered multiple stable isotopes for numerous elements using a mass spectrograph. In 1919 Aston studied neon with sufficient resolution to show that the two isotopic masses are very close to the integers 20 and 22, and that neither is equal to the known molar mass (20.2) of neon gas. This is an example of Aston's whole number rule for isotopic masses, which states that large deviations of elemental molar masses from integers are primarily due to the fact that the element is a mixture of isotopes. Aston similarly showed[when?] that the molar mass of chlorine (35.45) is a weighted average of the almost integral masses for the two isotopes 35Cl and 37Cl. (spin 9), is thought to be the rarest of the 253 stable isotopes, and is the only primordial nuclear isomer, which has not yet been observed to decay despite experimental attempts. ^ Soddy, Frederick (1913). "Intra-atomic charge". Nature. 92 (2301): 399–400. Bibcode:1913Natur..92..399S. doi:10.1038/092399c0. ^ This notation seems to have been introduced in the second half of the 1930s. Before that, various notations were used, such as Ne(22) for neon-22 (1934), Ne22 for neon-22 (1935), or even Pb210 for lead-210 (1933). ^ a b "Radioactives Missing From The Earth". ^ "NuDat 2 Description". Retrieved 2 January 2016. ^ a b c Ley, Willy (October 1966). "The Delayed Discovery". For Your Information. Galaxy Science Fiction. pp. 116–127. ^ a b Nagel, Miriam C. (1982). "Frederick Soddy: From Alchemy to Isotopes". Journal of Chemical Education. 59 (9): 739–740. Bibcode:1982JChEd..59..739N. doi:10.1021/ed059p739. Soddy announced his "displacement law" in: Soddy, Frederick (1913). "The Radio-Elements and the Periodic Law". Nature. 91 (2264): 57–58. Bibcode:1913Natur..91...57S. doi:10.1038/091057a0. .
^ Soddy first used the word "isotope" in: Soddy, Frederick (1913). "Intra-atomic charge". Nature. 92 (2301): 399–400. Bibcode:1913Natur..92..399S. doi:10.1038/092399c0. ^ Fleck, Alexander (1957). "Frederick Soddy". Biographical Memoirs of Fellows of the Royal Society. 3: 203–216. doi:10.1098/rsbm.1957.0014. p. 208: Up to 1913 we used the phrase 'radio elements chemically non-separable' and at that time the word isotope was suggested in a drawing-room discussion with Dr. Margaret Todd in the home of Soddy's father-in-law, Sir George Beilby. ^ Budzikiewicz H, Grigsby RD (2006). "Mass spectrometry and isotopes: a century of research and discussion". Mass Spectrometry Reviews. 25 (1): 146–57. Bibcode:2006MSRv...25..146B. doi:10.1002/mas.20061. PMID 16134128. ^ Scerri, Eric R. (2007) The Periodic Table, Oxford University Press, ISBN 0-19-530573-6, Ch. 6, note 44 (p. 312) citing Alexander Fleck, described as a former student of Soddy's. ^ Thomson, J. J. (1912). "XIX. Further experiments on positive rays". Philosophical Magazine. Series 6. 24 (140): 209–253. doi:10.1080/14786440808637325. ^ Thomson, J. J. (1910). "LXXXIII. Rays of positive electricity". Philosophical Magazine. Series 6. 20 (118): 752–767. doi:10.1080/14786441008636962. ^ Sonzogni, Alejandro (2008). "Interactive Chart of Nuclides". National Nuclear Data Center: Brookhaven National Laboratory. Retrieved 2013-05-03. ^ Hult, Mikael; Wieslander, J. S.; Marissens, Gerd; Gasparro, Joël; Wätjen, Uwe; Misiaszek, Marcin (2009). "Search for the radioactivity of 180mTa using an underground HPGe sandwich spectrometer". Applied Radiation and Isotopes. 67 (5): 918–21. doi:10.1016/j.apradiso.2009.01.057. PMID 19246206. ^ "Radioactives Missing From The Earth". Retrieved 2012-06-16. ^ Jamin, Eric; Guérin, Régis; Rétif, Mélinda; Lees, Michèle; Martin, Gérard J. (2003). "Improved Detection of Added Water in Orange Juice by Simultaneous Determination of the Oxygen-18/Oxygen-16 Isotope Ratios of Water and Ethanol Derived from Sugars". J. Agric. Food Chem. 51 (18): 5202–6. doi:10.1021/jf030167m. PMID 12926859. ^ Treiman, A. H.; Gleason, J. D.; Bogard, D. D. (2000). "The SNC meteorites are from Mars". Planet. Space Sci. 48 (12–14): 1213. Bibcode:2000P&SS...48.1213T. doi:10.1016/S0032-0633(00)00105-7.